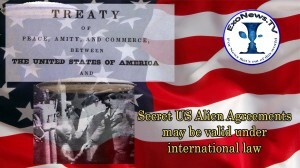 The legitimacy of secret agreements between the U.S. Government and alien civilizations may be valid under both U.S. and international law contrary to widespread public perceptions. This shocking conclusion has emerged from legal research into the status of agreements reached by a sitting US. President with the chief executive officer of a foreign power. The President … shall have power, by and with the advice and consent of the Senate, to make treaties, provided two thirds of the Senators present concur. Recent research has however discovered the legal concept and practice of an “executive agreement” that rules out such reasoning. An “executive agreement” makes it possible for a U.S. President to reach an agreement with a foreign power without the advice and consent of the U.S. Senate. Furthermore, under international law, executive agreements are recognized as valid, even if these have been conducted in secrecy. Also, the U.S., Supreme Court has ruled that executive agreements are valid, even if the U.S. Congress is not consulted. The disturbing conclusion is that executive agreements signed by President Eisenhower and his successors with representatives of an extraterrestrial civilization may be legal under both international and U.S. domestic law. The only caveat is if the executive agreement violates the U.S. Constitution, then the Supreme Court could strike it down. If an executive agreement is highly classified, however, then it is highly unlikely to be brought before the Supreme Court for adjudication. This basically removes the sole known judicial mechanism for striking down an executive agreement signed by a U.S. President. The idea that secret “executive agreements” reached by U.S. Presidents and extraterrestrial civilizations may be constitutional will come as a shock to many. Unfortunately, executive agreements are valid in international law and even recognized by the U.S. Supreme Court. Consequently, there is likely to be an extensive number of secret “executive agreements” reached between the U.S., and perhaps even other governments, with representatives of extraterrestrial civilizations. Urgent action needs to be placed on exposing these agreements to eliminate any wrong doing, and ensure that they comply with the U.S. Constitution, and International law and Human Rights standards.